The old Levi Strauss factory on Valencia near 14th Street in the North Mission. The radical La Raza newspaper Basta Ya! ran a piece describing conditions in the late 1960s. Oscar Grande, longtime organizer at PODER, describes how his mother, a Salvadoran immigrant, worked at Levi's on Valencia for decades. When people around the world think of blue jeans, they often think about the San Francisco firm that started it all: Levi Strauss & Co. This global phenomenon has very humble beginnings. 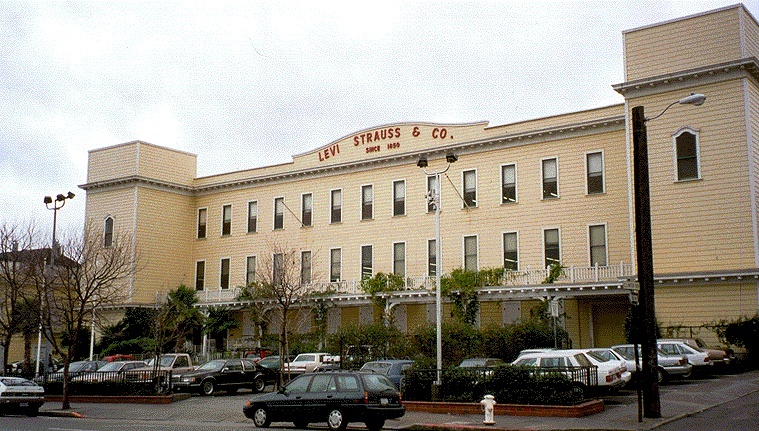 In 1853, a Bavarian immigrant named Levi Strauss travelled from America's East Coast, where he had learned the dry goods trade, to San Francisco, there to open a wholesale dry goods business with his brother-in-law, David Stern. According to the story, he created a sturdy pair of miners' pants from some canvas-like material he brought with him -- the genesis of the first jeans. The denim cloth derived its name from the French town of Nimes from which it came originally, hence its name "de Nimes" or as it became Americanized, "denim." 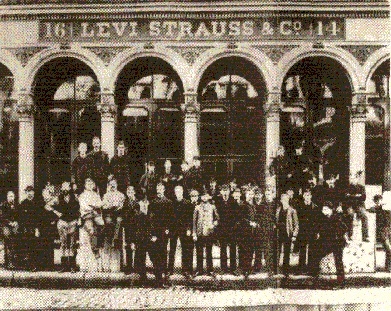 Levi Strauss and Company; group photo at 14-16 Battery Street, between 1872 and 1906. By 1872 Levi was a prosperous merchant, with headquarters and showroom at 14-16 Battery Street. In that year, he got a letter from a customer of his, a Nevada tailor named Jacob Davis, who regularly purchased bolts of cloth from Levi Strauss & Co. Davis had come up with a novel way of strengthening the pants he was making for his customers: he put metal rivets in pocket corners and at the base of the button fly. He wanted to patent the idea, but didn't have the money to get the paperwork through, so he suggested that he and Levi patent the process together. Strauss knew a good opportunity when he saw it, and in 1873 both gentlemen were named in the patent. Levi opened the first San Francisco manufacturing facility that same year, on Fremont Street, and they soon began to make the "copper riveted clothing" that was to make them famous. When the 1906 earthquake and fire destroyed both company buildings, Levi's quickly got back on its feet, building a new headquarters at Pine & Battery, and a new factory at 250 Valencia Street. Levi's nephews, the four Stern brothers, had inherited the business when their uncle died, but by the early 1920s the men were getting too old to run it. So, President Sigmund Stern asked his new son-in-law, Walter A. Haas, to step in and take over. Haas and his brother-in-law Daniel Koshland took the small company in hand and began to shape it into the multinational giant it is today. They expanded advertising, emphasizing Levi's links to the American West. After World War II, they dropped the dry goods wholesaling part of the business to concentrate on manufacturing the denim products and Western clothing that were becoming more and more popular. Walter Haas, Jr. was named President in 1958, and his brother Peter took over the position in 1970. This next generation oversaw the construction of domestic plants all over the South, taking advantage of the non-union climate that had been ensured by widespread violence and union-busting during the Depression. They started what is today the enormously huge division known as Levi Strauss International. In 1981 Bob Grohman, the only non-family member to serve as President, assumed his duties. Then, in 1984, after having worked his way through the company since his first day in 1973, Walter Haas, Jr.'s son Robert took over as President and CEO, continuing the family tradition: he is Levi Strauss' great-great-grand nephew. Levi's continues to cling to its San Francisco roots; Levi's Plaza, the company's World Headquarters, is located on Battery Street near the waterfront, a location for which Levi himself would have given hearty approval. Levi's also owns the Icehouse, a block away, and has been diligent in its efforts to retain the building's character while creating office space for employees. 1970s Levi's Garment Workers conditions in Basta Ya!